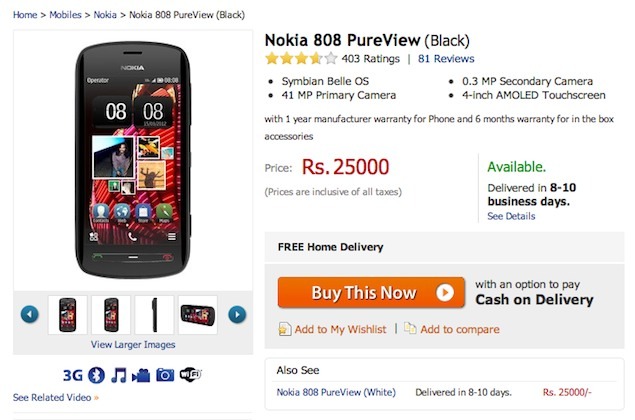 Nokia 808 PureView, the phone best known for its 41-megapixel camera is now available from online retailer Flipkart for Rs. 25,000 only. That's a significant price cut from its launch price of Rs. 33,899. Interestingly, as of filing this report, the official Nokia online store continues to sell it for the earlier list price. Aside from the camera that has won rave reviews, the Nokia 808 PureView features a 4-inch 640x360 display, a 1.3 GHz single-core processor, 512 MB of RAM and 16GB of on-board memory that is expandable using a microSD card. Unfortunately, the phone runs on the dated Nokia Belle (Symbian OS 10.1) platform. While it was difficult to recommend the Nokia 808 PureView at its earlier price, at Rs. 25,000 it is definitely worth another look, especially for photography enthusiasts. Nokia's PureView technology will also be seen in the forthcoming Lumia 920. The PureView technique involves taking a full image and oversampling it to the effective resolution you've selected. Oversampling an image means combining adjacent pixels into one. The more pixels you combine, the more accurately the resultant pixel represents real-world information.